This is his third marriage and her first. French President Nicolas Sarkozy is believed to have married former Italian supermodel Carla Bruni at a small private ceremony held at the Elysee palace last week, a French newspaper reported Monday. In a report posted on its website, L’Est Republicain newspaper quoted an unnamed “source close to a witness who attended the ceremony” as saying that it was a “small, very private” affair held at the presidential palace on Thursday. Presidential spokesman David Martinon declined to comment on the report. Sarkozy, 52, told a news conference last week that his relationship with 40-year-old Bruni was “serious” and suggested he planned to marry the former supermodel and pop singer. “There is a strong chance that you will learn about it once it’s already been done,” the president said. The Journal du Dimanche reported earlier that the couple would marry around February 9. Rumours about an imminent marriage have been flying since last week and a Paris city hall office in the chic 16th district was besieged by journalists on Thursday who had received a tip-off that the couple were getting married there. Sarkozy on Monday visited Saudi Arabia and Qatar as part of a tour of Gulf countries and was to head to Dubai on Tuesday. An AFP journalist traveling with the president said he was not wearing a wedding ring on Monday. In October, Sarkozy became the first French president to divorce while in office when he ended his stormy 11-year marriage to Cecilia Ciganer-Albaniz, with whom he has a 10-year-old son, Louis. He also has two sons, Pierre, 22, and Jean, 21, from a previous marriage to Marie-Dominique Culioli. Born into a wealthy Turin tyre-manufacturing family, Bruni has a six-year-old son with the philosopher Raphael Enthoven, but she has never married. Bruni’s previous affairs with such rock stars as Mick Jagger and Eric Clapton have made tabloid headlines and she was quoted in a French magazine last year as saying “Monogamy bores me terribly”. After visiting Egypt and Jordan with Sarkozy last month, she may accompany Sarkozy on a state visit to India later this month. The latest rumours about the marriage drew criticism from opposition Socialists that Sarkozy was putting too much of his private life on public display. “It’s a bit like the monarchy, where an event in the king’s private life become a political event,” Royal told French radio. Sarkozy’s second wife Cecilia lost a bid in court last week to block the release of a book in which she is quoted as described the president as a womaniser and uncaring father. The book “Cecilia” by journalist Anna Bitton has become a best-seller in French bookstores. With Sarko’s two prior divorces and his reputation as a ladie’s man, and her prior history of being “the other woman” who came between Jerri and Mick, and Donald and Marla, this is going to be tabloid heaven a la francaise. Sarko in Kabul, and let’s drink to that! 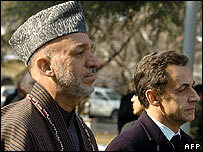 Mr Sarkozy recently pledged France’s support for the US in Afghanistan. Did you know Sarko’s horse is named Universe? France’s UMP political party presidential candidate Nicolas Sarkozy speaks with accompanying journalists aboard a tractor as he rides “Universe” on a ranch in Saintes-Maries de la Mer, southeastern France, April 20, 2007. For those of you asking, Napoleon didn’t ride the Universe. 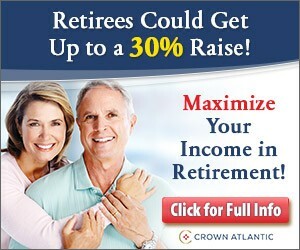 Maybe Sarko has been getting my spam, and should the Pope get a makeover? Franco Zeffirelli, the Italian film, stage and opera director, has said Pope Benedict XVI needs a makeover of his “cold” image and “showy” clothes. 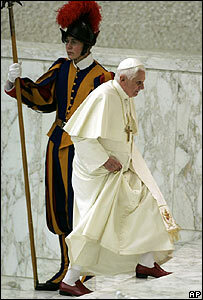 Lacking his predecessor’s charisma, Pope Benedict has taken to wearing some eye-stopping outfits in public, such as a red velvet cape trimmed with ermine, not worn in public since the death of John XXIII in 1963. Even when he favors all-white, I for one like the ermine cape. It’s so… Papal. He came, he pitched a tent, he conquered. 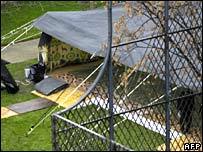 Gaddafi (he of the multiple spellings – Gaddafi, Kadhafi, whatever) spent five days in Paris, accompanied by his bodyguard babes, and left with several deals, not the least of which is “a co-operation accord to develop the peaceful use of nuclear energy”. We all have heard about “peaceful use of nuclear energy” in other quarters. France is the first Western country to welcome Col Gaddafi since he took the decision to end the country’s diplomatic isolation four years ago. French President Nicolas Sarkozy on Monday dismissed those who criticise his human rights record as coffee-drinking intellectuals who stood idly by while he fought to change things. “It is all well and good to never get your shirt wet, to take no risks, to stay on the sidelines, to speak to no one, to be so sure of one’s self and what one believes in while sipping one’s cafe creme on the boulevard Saint-Germain,” he said, referring to a traditionally intellectual, rich area of Paris. Muammer Gadaffi, the Libyan leader, yesterday began a five-day visit to Paris to buy arms, nuclear power and civil airliners, triggering a storm of criticism from campaigners and an outburst from a government minister who said France should not accept his “kiss of death”. Moammar Gadhafi swept into town with all the trappings of his Bedouin heritage Monday and got straight to business, cutting $14.7 billion in deals for arms and nuclear reactors on his first official visit to the West since renouncing terrorism and atomic weapons. President Nicolas Sarkozy defended the visit, saying it is France’s duty to encourage states that move toward international respectability. I still think the word “nuclear reactor” shouldn’t be on the same sentence as the guy who’s connected to “Lockerbie, Scotland”, no matter how graceful the move toward international respectability. What strikes me about Sarkozy’s attitude is its total absence of embarrassment, the lack of any attempt to excuse or explain: business trumps human rights. Full stop. Contrast this with the behaviour of Gordon Brown and the British government when King Abdullah of Saudi Arabia came on his state visit to London six weeks ago. Embarrassment oozed out of every British pore. We really don’t want to do this and wish we didn’t have to, was the clear message – never spoken out loud – but we’d better, because the Saudis help us catch terrorists and buy things from us. Human rights? Jolly important, but we won’t mention it now, in case they get cross; but we assure you we’re working on it behind the scenes. The British and French governments were doing the same thing – entertaining a tainted head of state to make money. 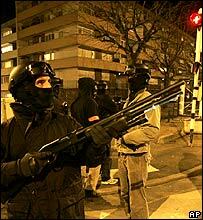 Sarkozy did it openly, almost proudly; Brown hypocritically. The prime minister did, it’s true, demonstrate his human-rights credentials with his easy, unnecessary, pointless and possibly counter-productive boycott of the EU-Africa summit last week, because Robert Mugabe was there. But then, Zimbabwe isn’t buying billions of pounds’ worth of British goods. Although Kadhafi‘s Paris visit has led to a number of criticisms by French lawmakers (notice reactions like the crybaby Christiane D’s agreeing with the dictator as well as pouting how much the Iraq war had led to suffering for… Europe — Europe, for Christ’s sake! ), heaven forbid that there be any demonstrations like that in Paris when George W Bush came to commorate the 60th anniversary of D-Day. Heaven forbid as well that there would have been a glowing reception given to the American president like the Ritz event described by Ariane Chemin in Le Monde in which Kadhafi is told he has nothing but friends and is oohed and aahed over by Paris’s intelligentsia. 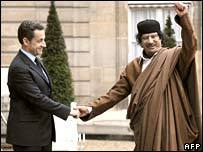 The question remains, Did Sarkozy tackle human rights with Colonel Gaddafi? Sarko told France2 TV anchor David Pujadas, “No, absolutely not”; at the same time Sarko says he told Gaddafi that more needed to be done “to improve human rights in Libya. Possibly. But one involving 21 Airbus aircraft and 10 billion Euros. The trouble arises when one pursues moral diplomacy and realpolitik with the same country. Were the arms contracts from Libya part of the deal to free the Bulgarian nurses? 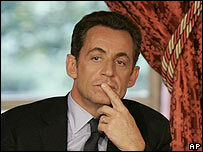 Mr Sarkozy says not, but the terms are being looked at by a parliamentary inquiry. Mr Sarkozy is pressing to free hostages in Colombia, among them Ingrid Betancourt, a Franco-Colombian. But he also persuaded the Colombians to free a top guerrilla from the FARC, considered a terrorist group by America and Europe. In short, Mr Sarkozy’s action-man diplomacy is about results, not means: if it works, it works. The release of Ms Betancourt, for instance, would be warmly welcomed in France. And Mr Sarkozy has no time for left-bank intellectuals “so sure of what they think while drinking coffee on the Boulevard Saint-Germain”. They may not have much time for him, either. America did not tell the millions of men and women who came from every country in the world and who—with their hands, their intelligence and their heart—built the greatest nation in the world: “Come, and everything will be given to you.” She said: “Come, and the only limits to what you’ll be able to achieve will be your own courage and your own talent.” America embodies this extraordinary ability to grant each and every person a second chance. My generation shared all the American dreams. Our imaginations were fueled by the winning of the West and Hollywood. By Elvis Presley, Duke Ellington, Hemingway. By John Wayne, Charlton Heston, Marilyn Monroe, Rita Hayworth. And by Armstrong, Aldrin and Collins, fulfilling mankind’s oldest dream. America’s strength is not only a material strength, it is first and foremost a spiritual and moral strength. No one expressed this better than a black pastor who asked just one thing of America: that she be true to the ideal in whose name he—the grandson of a slave—felt so deeply American. His name was Martin Luther King. He made America a universal role model. Say Anything has the video of the whole speech. 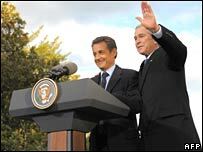 Later on, at Mount Vernon, US President George W Bush and French President Nicolas Sarkozy have said they will work jointly to convince Iran to give up its nuclear programme. What’s particularly interesting is that, years ago when the Bush presidency was new and Iraq was a fresh issue, the left told us constantly that George Bush was making America less popular in the world. Yet during the President’s term in office three of our traditional allies (Canada, Germany and now France) elected leaders that displaced virulently anti-Bush and anti-American leaders with people more of Sarkozy’s temperament (Stephen Harper in Canada and Angela Merkel in Germany). We’ll see what the media reports on the rest of the trip. More blogging later, when I’ll be posting about Venezuela.